Connected with the national partner activities we carry out four European events. 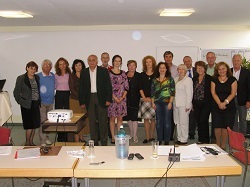 In the project phase 2013, we organize two transnational partner meetings, one training seminar for actors from companies and a final conference about topics of further training in practice and progressive steps in Social Dialogue. Here all transnational partner events are documented. Topics: Interims results from transnational networking, sector activities and practical experiences from companies; information and discussion about qualification standards – learning agreements.